The Multiple Image Choice Template requires Participants to answer a question by selecting the correct answer from a range of images. The Multiple Image Choice Template requires Participants to answer a question by selecting the correct answer from a range of images. This makes it a good template for testing visual recognition. Step 1: Select the Multiple Image Choice Template from the ‘Checkpoint Questions’ panel. 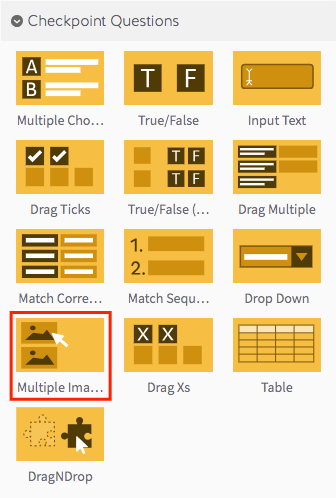 Step 2: Drag your Multiple Image Choice Template into the Lesson Pathway. Step 5: There will be a Multiple Image Choice question preloaded in the ‘Checkpoint Question Editor’ box. Click the edit button to start creating it. Step 7: Click the green ‘Add Answer’ button. Step 8: Click on the ‘Add Image’ button and upload or choose an image as an answer option, then select if it is the correct answer. For more information on using the ‘Add Image’ button, click here. Step 9: To keep adding answer options, repeat Steps 7 and 8. Note: The Multiple Image Choice Template offers three additional options. Firstly, you can provide custom feedback, which lets you add custom feedback text for both correct and incorrect answers. Secondly, you can choose to create a pool from the available answers to make it harder for a student to answer your question through simple memorisation. 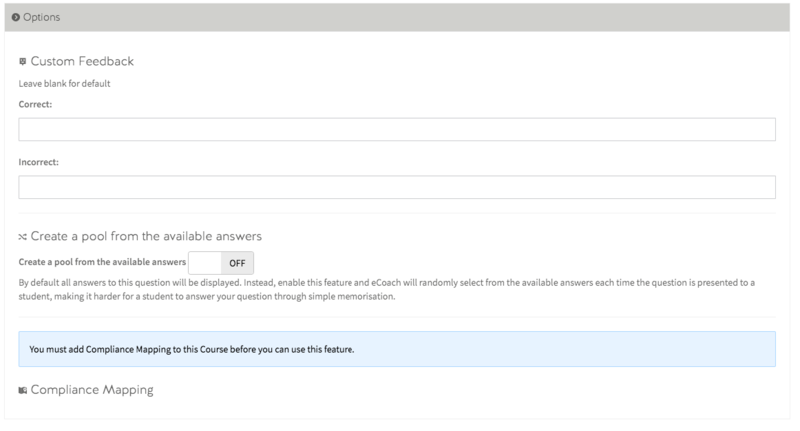 You can also map your learning outcomes to each dropdown question.